Passed away peacefully on July 17, 2013. Much loved husband of Glennis. Loved father and father in law of Katrina and Matthew, Craig and Vanessa, Shaun and Ebba, Cameron and Jane. Beloved Poppy of Callum, Saskia, Zali, Mathilda, Madeleine, Melanie, Jaymi and Hayden. A wonderful gift to our family Forever treasured in our hearts and memories. Relatives and friends are invited to attend Brian’s funeral service to be held in the chapel, Parsons Funeral Home, 278 Princes Highway, Bulli on Friday at 10am. I have just phoned the Funeral home and a Police Guard of Honour has been arranged. 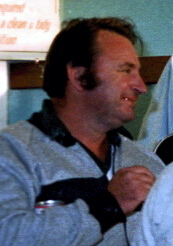 ‘Oggy’ was a Sergeant at Wollongong in the 1980’s on General Duties & Sutherland and also involved in the Police Football of that era.